If you’re a creative, photographer, blogger, or small business owner, you need to know how to protect your business. And a primary way to protect your business is to protect your content from copyright infringement. Unfortunately, there is no way to 100%, definitively keep someone from infringing on your work, even with preventative measures. But what you do after an infringement occurs is key. So let’s discuss what you should do when someone infringes on your copyright. The first thing I recommend is avoiding immediate contact with the alleged infringer. As soon as you contact that person, they’re going to start destroying any evidence they can. Some things they should do, like removing the work, but other things you want to avoid. They may even block you! 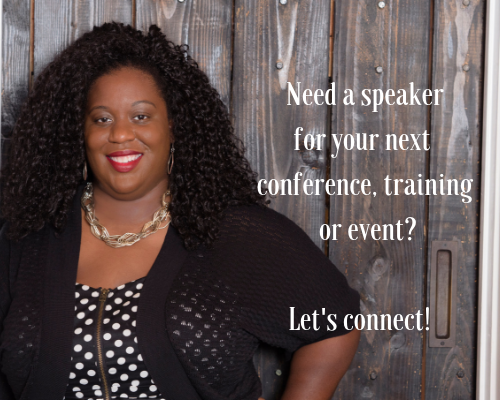 Don’t contact the person or business until you have all of your ducks in a row. 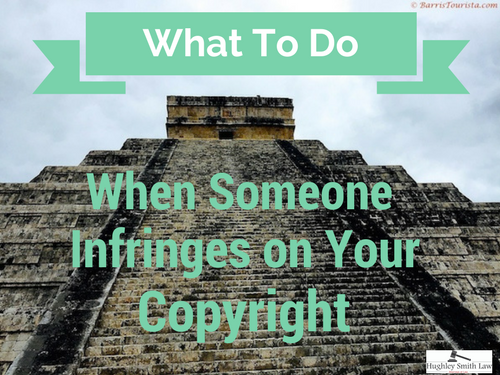 The second thing you, as the copyright owner, want to do is do some digging and find out as much information about the infringer as possible. First and foremost, you want to take quality screenshots of the infringements, as that is your strongest evidence showing that the infringer is actually using the work. Make sure your screenshots to find evidence that shows the website URL or their social media profile name along with the infringement. If the evidence is on social media, go through to see if they’ve posted your work multiple times. This information can be used in a complaint for copyright infringement, if the matter gets to that point. But don’t stop there. You want to dig a little deeper when collecting evidence. Find out the address, email address, and phone number of the business or individual. Go to the Secretary of State’s website and see if you can find any business records. All of this will be extremely important if you want to move forward with sending a cease and desist letter. It’s also crucial to look for the removal of any copyright management information (CMI). For example, if you had a watermark on your photo or your video, has it been stripped away? Ask yourself the following: Was credit stripped away? Did you post this with a copyright notice? Did your original work have CMI embedded in the photo or video? If that is the case and that’s been removed, you want to get evidence of that. The removal of copyrights could result in the infringement of the Digital Millennium Copyright Act (DMCA) and could entitle you to additional damages. Now, before you go and say, “Hey, you’re infringing on my work,” you may want to check a few things on your end as well. For example: Let’s say you’re a blogger and you take pictures of a particular property. If you’ve given that company rights, you want to make sure the “infringer” isn’t a subsidiary, or a parent company, or an affiliated company of the original company before you make the accusation. It’s very important to make sure and check your own license and sublicense history to make sure that you are not accusing a business prematurely. They may have a lawful license. You always want to make sure that you’re not accusing someone that you’ve actually given rights to through some inadvertent action as a contest or using a particular hashtag on social media. After you’ve taken these steps, you can decide what you want to do next. Some copyright owners are content to just reach out and contact the person and simply ask for credit. Another option is a DMCA takedown. Social media outlets like Facebook and Instagram have mechanisms where you can go in and have the work taken down based on copyright infringement. It’s not foolproof, but unless the person goes in and puts in a counter-notice stating that your assertion is an error, these outlets will take your work down. And of course, you can opt to send a cease and desist letter. I have found, on behalf of my clients and people who have had copyright infringement issues, that a cease and desist letter often has better results when it comes from an attorney. Certainly, we at Hughley Smith Law can help you with all of your copyright infringement needs. This is one of the areas that we’re really passionate about. We want to make sure that if you create something, someone else isn’t profiting from it, because nobody has time for that! 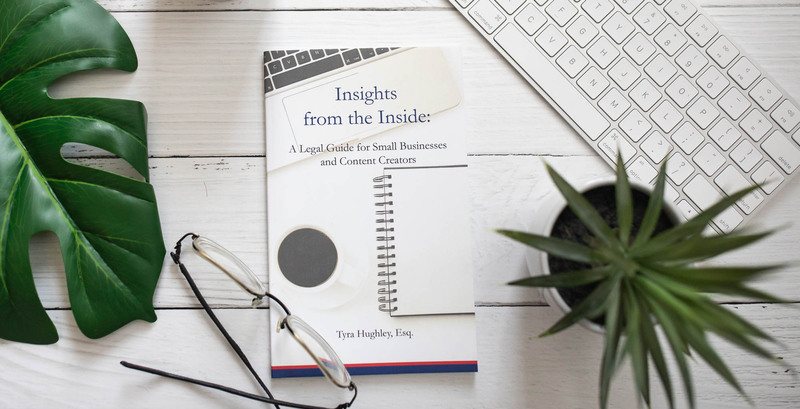 If you have any questions about these steps or about how we can help your business if someone infringes on your work, please do reach out to us. If someone has infringed upon your work, feel free to fill out this copyright infringement evaluation form and we will assess your case. Nothing in this article is meant to be construed as legal advice nor does it constitute an attorney-client relationship with the attorneys of Hughley Smith Law.